ClassNK released a new version of its PrimeShip-HULL (HCSR) ship design support software that is fully compliant with the new IACS Common Structural Rules (harmonized CSR) for oil tankers and bulk carriers. 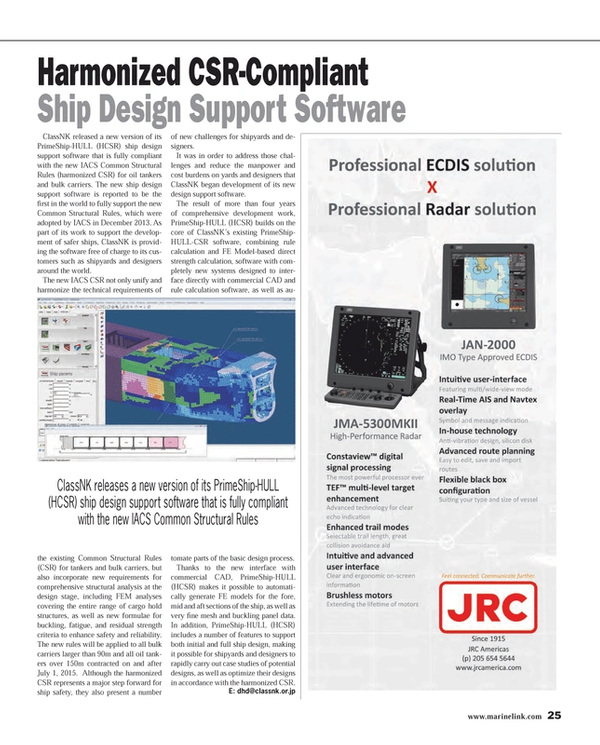 The new ship design support software is reported to be the first in the world to fully support the new Common Structural Rules, which were adopted by IACS in December 2013. As part of its work to support the development of safer ships, ClassNK is providing the software free of charge to its customers such as shipyards and designers around the world. The new IACS CSR not only unify and harmonize the technical requirements of the existing Common Structural Rules (CSR) for tankers and bulk carriers, but also incorporate new requirements for comprehensive structural analysis at the design stage, including FEM analyses covering the entire range of cargo hold structures, as well as new formulae for buckling, fatigue, and residual strength criteria to enhance safety and reliability. The new rules will be applied to all bulk carriers larger than 90m and all oil tankers over 150m contracted on and after July 1, 2015. Although the harmonized CSR represents a major step forward for ship safety, they also present a number of new challenges for shipyards and designers. It was in order to address those challenges and reduce the manpower and cost burdens on yards and designers that ClassNK began development of its new design support software. The result of more than four years of comprehensive development work, PrimeShip-HULL (HCSR) builds on the core of ClassNK’s existing PrimeShip-HULL-CSR software, combining rule calculation and FE Model-based direct strength calculation, software with completely new systems designed to interface directly with commercial CAD and rule calculation software, as well as automate parts of the basic design process. Thanks to the new interface with commercial CAD, PrimeShip-HULL (HCSR) makes it possible to automatically generate FE models for the fore, mid and aft sections of the ship, as well as very fine mesh and buckling panel data. In addition, PrimeShip-HULL (HCSR) includes a number of features to support both initial and full ship design, making it possible for shipyards and designers to rapidly carry out case studies of potential designs, as well as optimize their designs in accordance with the harmonized CSR.